Monster veggies are a wonder to watch growing. 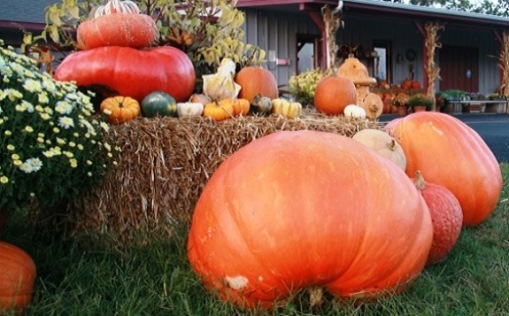 Some, like giant pumpkins, can gain around the same weight as a 5yr old child every 2-3 days! Many will be inedible, being tough as old boots or dry and fibrous, and taste usually goes out the window... but the photo will look good! There are public competitions for monsters, especially for growing giant pumpkins. These are serious... things get very competitive. But keep it fun; there's no need to hire guards or camp out at night to protect this 'monster,' and if your child has a competitive nature, have a family 'grow a monster veggie' competition. You may like to initiate a local competition? Perhaps send away for a large packet of monster seeds, then print out growing instructions and distribute them to your child's class... or offer to sell them each for a small sum at the school fete. The seed supplier may like to donate a prize. Buy the seeds of the giant varieties. Some hybrid vegetables are large, but you won't be able to save the seeds for the next year as they won't breed true. Most prize winning large vegetables have well-known favourites that have been around a while and are open-pollinated so seeds can be saved. In early spring nearly fill 15cm (6") plant pots with potting mix, and poke in one seed per pot. 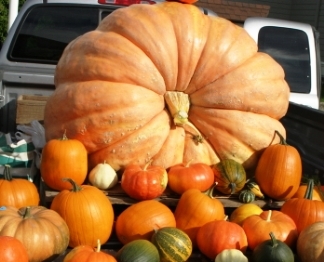 Children find large seeds such as pumpkins easy to handle. Tell them to poke the seed in with the pointy side down, but if in doubt, on its side or flat is okay. The shoots will always know which way to go up and the roots will always go down. Water and keep damp. Put pots in a warm, bright spot once the seeds sprout usually within a week. Let them grow in their nursery pots until the first true big leaves are showing. Don't let them wilt from too much hot sun if on a windowsill... move them away from the glass. Transplant into a permanent spot in garden around 3 weeks or so after first sowing the seeds. Move them oh so carefully and keep as much soil on the roots and have the hole prepared to pop them into. They may need to be protected from late frosts or winds with a temporary clear cover to begin with. Have 5 star accommodation and plenty of room for these amazing plants to show off what they are capable of. That means the sunniest and most sheltered spot in your garden. It should be handy for tending to, because you don't want to slip up and not water them or de-bug them when they need it. Plant your prize winning seedlings or seeds into the most perfect soil/compost you can. If possible prepare the soil months before, around fall, with lots of manure and compost. Give weekly boosts of liquid organic fertiliser or compost tea, but remember some plants like a slightly acid soil, like tomatoes, so if unsure, have your soil pH tested. Don't sporadically water, keep the watering steady and make sure it goes deep down, and then before it dries out completely give another deep watering, and so on... but don't let your plants sit in soggy conditions all the time. Sometimes the bees, birds or wind are not always around when they should be reporting for work — so step in and lend a hand. It's easy to do with pumpkins and other squash type veggies. Pumpkin flowers start appearing a month or two after transplanting. Early in the morning pick some male flowers and gently tear off their petals to expose the middle stamens with the powdery pollen on. Only female flowers have a little bulbous bit at their base, like a tiny pumpkin, if it's a pumpkin plant, or a tiny zucchini if it's a zucchini etc. Push a male stamen into a female flower so that it rubs on the female stigma inside and leave it there. This is called setting the fruit or getting the fruit set, and the earlier you do it, the more time you give your monsters to GROW. The biggest and healthiest vegetable fruits are the ones to keep. 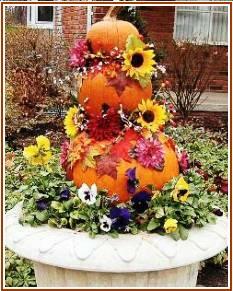 For pumpkins, carefully cut or pinch out all others except for 3-7 of the best, which should be at least 3 m (9.5 ft) from where the main stem is planted in the ground. These few pumpkins you have can now go bananas without competition for water and nutrients. Early on, if you haven't already chosen pumpkins with stems at right angles and if possible upright from the vines, then carefully edge each vegetable into a better angle for a more upright stance. Do it a bit each day for a week or two. This is not absolutely necessary, but adds a little edge to the growing process and stops the large pumpkins from being such a drag on the vine. In other words, instead of the stem growing acutely out from the main vine, edge the stem of the pumpkin over so that it's perpendicular, or pointing out and up. At some time mid season on, you may decide it's worth concentrating on the biggest, fastest growing and best rounded shape of the bunch, so remove the other fruits and let the king monster have it all. Don't let the vines grow out of control. Chop off their growing tips about 4 m (12 ft) distance from each set pumpkin. Side vines should be arranged at right angles to the main stem to allow for easy access. Side vines can be chopped off at 2-3 m (6-9 ft). Leave most of the foliage on though as that provides the energy from the sun to enable the plant to grow. From the main root to where the first pumpkin is growing there will be lots of leaf axils (where a leaf joins the vine stem). Now pile on some surrounding good quality soil on these axils, keep these mounds watered, and they will develop more roots to help your monsters get more monstrous. Every day without fail these future champion vegetables should be checked out. Pests and diseases can attack when your back is turned. Have your remedies ready and pick off, squash, hose off or organically spray off any trespassers. Netting or stakes also protect against larger destroyers. A bit of patience, a spot of luck, good weather, 6 or more months on, and you'll have an experience and hopefully a memorable photo to remember for a while... until you grow even bigger giants next year!